Disrespect for healthcare workers is disrespect for patients and harmful to quality care! Sign the petition demanding that Chris be re-instated! Christine Nelson, a registered nurse and 19-year veteran at the Medical University of South Carolina was escorted from her office this afternoon after being rebuffed in her efforts to meet with supervisors. In recent weeks, Nelson and several coworkers in the Ambulatory Pre-Op Clinic in Rutledge Tower have complained of mismanagement and understaffing in their department. An attack on healthcare workers is an attack on quality healthcare and harms our patients. When we stand up for hospital workers, we are standing up for quality health care. Mary Moultrie, a leader of the Charleston hospital workers strike of 1969, called Nelson’s dismissal “another stain on MUSC’s reputation.” Moultrie observed that the hospital has been very successful in squelching dissent by disciplining “whistleblowers and others who speak out on behalf of patient care.” Charleston labor activist Leonard Riley observed that Nelson has been working with the South Carolina Human Affairs Commission to compile workers’ complaints against MUSC. Over the past two years, Nelson has spoken out against racial discrimination in the hospital, abuses of the Family Medical Leave Act and HIPAA (federal privacy law) violations by supervisors, as well as the hospital’s mistreatment of low wage workers. Her work to improve working conditions and patient care has led her to assume leadership roles in Healthcare Workers’ United, the South Carolina Progressive Network, and the Carolina Alliance for Fair Employment. She has also been active in the Truthful Tuesday Coalition and the Southern Workers Assembly. She accompanied a group of Charleston activists to the HK on J protest in Raleigh, North Carolina on February 8. Nelson is a lifetime member of Old Bethel UMC Church and is the mother of two children. 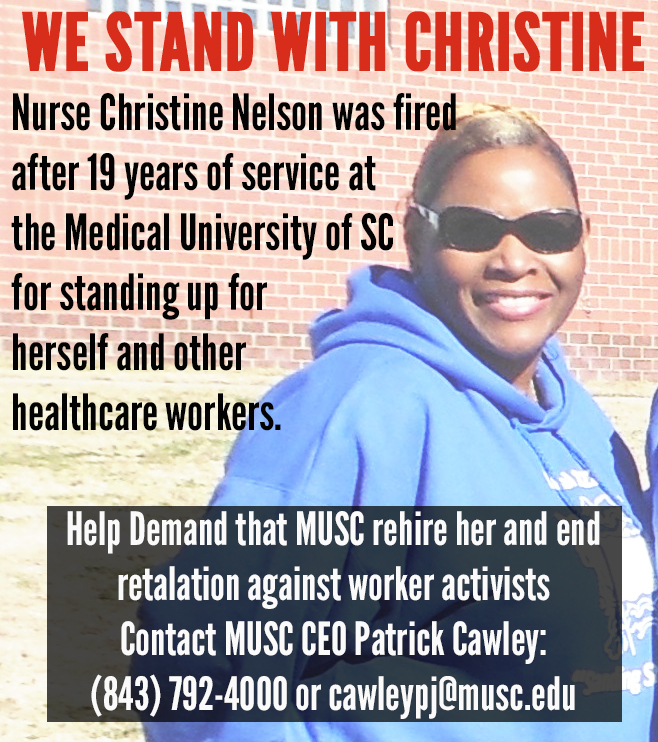 Healthcare Workers’ United invites you to stand with Chris by demanding that MUSC rehire her and end their efforts to retaliate against those workers who stand up for patients and for one another. Sign Petition to Reinstate Chris!